Brent Domann asked about the pickups in his Prime Time. Your Prime Time pickups started out as Schaller high output. [Two in One] Model #212 I googled and found these. Surprisingly, Schaller is still making the same pickups after 25 years! The Schaller Website. 2. Potted the coils in our homemade vacuum chamber. They are potted with a poly type two-part lacquer. 3. Added maple strips to each side of the bobbins and clamped these as they dried/cured. This presses all the wire as close to the pole pieces as possible and adds rigidity to the coils. ie. 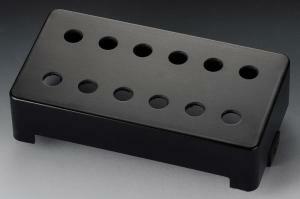 Our trademark 'Pressurewound' pickup. We started the patent process for this and the vacuum potting technique, but ran out of money. That's why we used a trademark. 4. Added copper shielding tape around the bobbin. Soldered this closed and added a ground wire to this shield. 5. Retapped the pole pieces for our own adjustable screws. 6. Drilled thru the bobbins to add 4-40 screws that go all the way thru the pickup and attach to the base plate. 8. Wired with 4-conductor shielded cable to interface with the switching. All this work made for a really solid/tight pickup. The potting process could melt the bobbins, so the earlier pickups were covered. Believe me; they looked awful! Later, we worked at limiting the time spent in the lacquer. 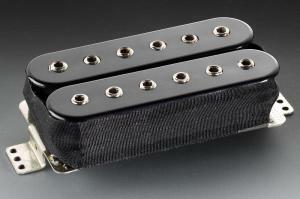 Shielding: All guitars have complete shielding in the pickup and control cavities. The pickguards, and later the back cover plates, have aluminum foil [Reynolds wrap] attached with 3M spray adhesive. Be careful when removing the pickguard. The foil can bind with the finish and you can damage the foil. If this happens, you need to remove all the parts on the pickguard and apply a new foil shield. The cavities were coated with a conductive paint. Earlier guitars use a copper paint and the later guitars have a gray graphite coating. Here's an AT3 with copper paint and tape to ground the back plate and the green ground wire running to the Kahler. Other guitars of this period used Schaller Golden 50's and S6 single coils. They were also modified. They kept their alnico magnets. The S6's were usually too HOT, so we removed wire from them according to their position. ie. neck, middle, &bridge. Some of the Vee's had monster pickups with 3 [count'em] THREE ceramic magnets. Giant Round Head Hex screws for the pole pieces. During tremolo dive-bombs the strings would totally get sucked onto the pickup. You'd hear this 'WHAK' and then silence... 'If Less is More, Than More is really MORE!' Complete Spinal Tap silliness. See the TomP's Vee in user submitted Photos. 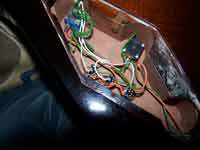 The earliest pickups were from Schaller, but we stripped off the wire and wound the bobbins with our own wire. This wire was thinner than 'normal' pickup wire [I forget the gauge]. This gave more high end & sensitive output. We wound them by hand on a drill press! You would sit there for hours hand feeding the wire and hoping that it didn't break! Later, I built a coil winding machine that ran on stepper motors controlled by an Atari 800. I never got this completely working, but it started me on my current career path. You will see a few guitars with different pickups. Around 1980, we were using Mighty-Mite parts before switching back to Schaller. MightyMite website. There's also some DiMarzio equipped guitars out there. The last guitars built had Stuart Duncan pickups with Floyd Rose whammies. Interesting note: Alan Stack found the vacuum pump at a garage sale. It was part of an undertaker's embalming Toolkit complete with hoses, pump, bottles for formaldehyde and removed blood. Plus gruesome looking tools for preparing the cadaver! Last edited by ChrisClark on Sat Nov 10, 2007 10:19 am, edited 1 time in total. What gauge was the thin wire used?